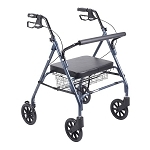 The Roscoe Rollator with 6-inch soft grip tires is perfect for indoor and outdoor use. 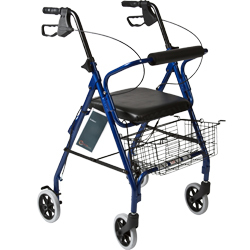 An easy-folding mechanism for quick storage, reliable loop style brakes and a straight padded backrest with larger mushroom style release buttons make the Roscoe Rollator a worry-free choice for you and your patients. 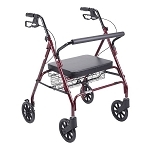 Choose from three attractive finishes. A limited lifetime warranty comes standard.